Most of us have no trouble remembering things for longer than 30 seconds (so can goldfish, really, but it’s my metaphor and I’m sticking with it). So when your organization sends me a message saying “URGENT BREAKING NEWS: we need your emergency help RIGHT NOW!” — I tend to remember that. And when a week, or a month, or a year goes by and you never mention that crisis again? Or how my support made a difference? Well, I remember that, too — and it leaves me wondering if the last crisis was really not that important, or if you didn’t notice that I took action or donated, or if you just think I’m a goldfish with internet access and a credit card. That’s why follow-up messaging is so important. It shows your supporters that your priorities are their priorities. It reminds them how connected they feel to you and your issue. It proves that their support makes an impact, it gives them a reason to stay involved, and it shows that you value and respect them. 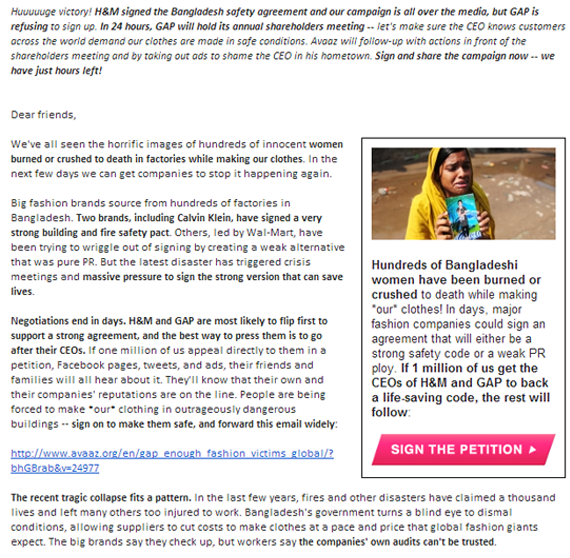 Avaaz used their victory with H&M to inspire their subscribers to keep up the fight for clothing factory worker safety. This message also uses a great tried and true time-saving technique: adding a liftnote to a previous email. This provides context for subscribers who didn’t read the last email (and odds are they didn’t with everything else they’re getting). Also — you don’t have to write as much new content. Double win!. 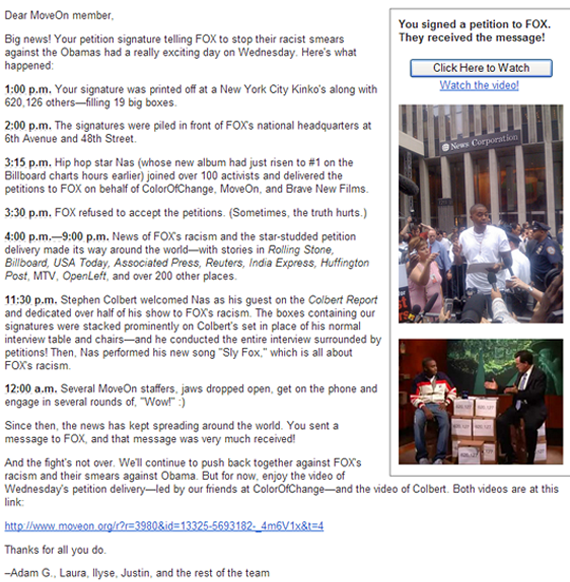 Did you organize an awesome petition delivery event? Was a decision maker or celebrity there? Don’t let that photo op go to waste! Photographic proof that someone important saw their messages is a great way to show action takers that their work paid off. Signatures are great, but they won’t pay the bills. 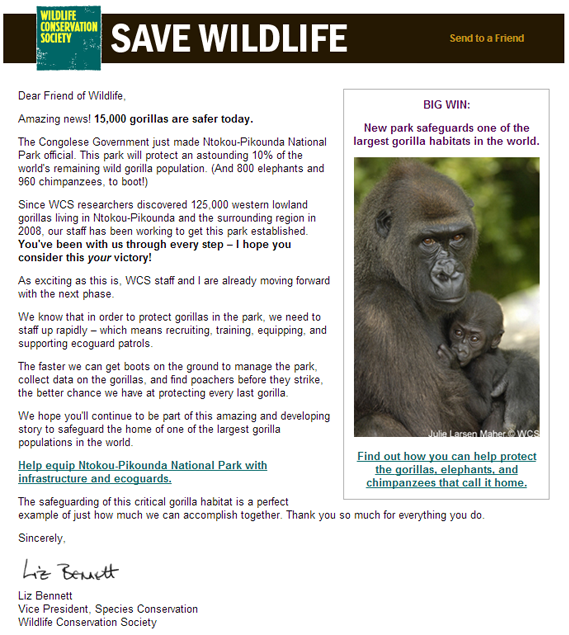 This follow-up from the Wildlife Conservation Society makes the case for giving while also touting a recent success. WCS makes it clear that this recent win wouldn’t have been possible without the support of people like you. Then they provide an opportunity to take an even larger role in this win and donate to the cause. When your organization is fighting the good fight on all fronts, you sometimes have to reach out to your list on a slew of issues in a short period of time. Let them see progress on all of those battles in one place. This will encourage your most committed action takers to keep up the momentum or join other fights, and it can inspire single-action takers to join fights they normally wouldn’t join or didn’t know about in the first place. This can be as simple as starting your email by reporting how many people took action. But if your supporters are more visual learners, the above example from Ready for Hillary communicates the huge number of responders in a pithy, but personal, way. Ultimately, you know your audience best. So employ any or all of the above techniques that feel right for you. And remember: Have fun! You work hard all year round to engage your supporters and achieve these victories. Take a moment to invite your subscribers to the party and toast them whenever you’ve got reason to celebrate.